The E330 FOCUS® AX and E350 FOCUS AX-SD advanced function residential meters surpass other meters in their class to deliver options you need for a highly functional and affordable metering solution. The combination of the FOCUS Service Disconnect base module and powerful AX register supports a variety of connect/disconnect and service-limiting applications. The result: A single solution to manage demand, time of use, load profile and reactive power—with no costly upgrades. Reactive energy and power quality measurements functions deliver empowering data to run advanced applications such as voltage monitoring, VAR control and load curtailment. 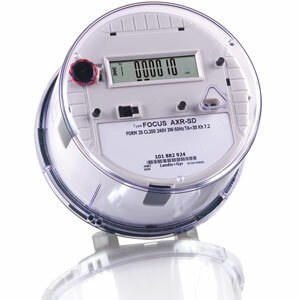 The E350 FOCUS AX-SD incorporates a 200A, motor-driven, cam action disconnect/connect switch under the meter cover. This advanced, market-leading switch, coupled with the field-proven reliability of the E350 AX-SD, delivers Landis+Gyr’s third-generation design answer to today’s evolving utility requirements.